A short while ago I reviewed the "standard" Vanguard Spirit 10x42's that really impressed me with an excellent overall score. But where they really stood out was in regards to their light weight design, excellent image quality and high quality optical components. 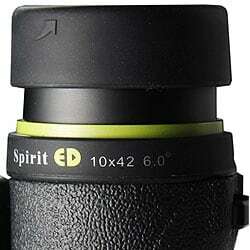 So when Vanguard told me that they were sending me their new Spirit binocular, the Vanguard Spirit ED 10x42 that now adds to the quality of the optical components by including extra low dispersion glass (ED) which should in theory improve the already impressive image quality, I eagerly awaited their arrival and my chance to review them. Vanguard have not just added the ED glass to the new Spirit (Spirit Plus), but there have also been many minor changes to the design of the body as well. These changes and I guess the addition of the ED glass does mean that their overall weight has increased slightly to 640g (22.6) compared to 600g (21.2oz) on the old Spirit binoculars, but even so they are still one of the lightest quality full sized binoculars on the market. Their dimensions of 145x125mm (L x W) are fairly standard for this class and overall the binocular is well balanced and feels very comfortable to hold and as with the old version this comfortable ergonomic feel is emphasized by the thumb indents on the underside of the barrels. I do like the tactile hard rubber armoring on the binocular that not only helps to protect them from any day to day knocks and bumps, but feels great to the touch and as with all rubber armoring helps to dampen down any sounds from objects hitting them - things like watches or wedding rings that often happens in my case, that could frighten away easily spooked birds and other wildlife. The Spirit ED 1042 is 100% waterproof and because they are filled with dry nitrogen gas, they are resistant to internal fogging which can happen in places where there is high humidity or when you get rapid temperature variations. Having the air replaced with a dry gas like nitrogen also has the added benefit of protecting the internal workings on a pair of optics from any corrosion that could occur. Often overlooked by many people are the eye-cups, but for me this is the point at which your instrument meets your face and so can make the difference between a good and a bad pair. The ones on the new Spirit ED's are great. Their rubber covering is softer and more tactile than what you find on most other binoculars and as such are very comfortable, meaning that you can push them more firmly against your face which has the benefit of blocking out more external light from the sides for a better overall view. The twist-up mechanism on the eyecups work well, they do however only have one fixed intermediate stop although you can stop them at any other point, but you will have to take more care to prevent them accidentally moving. Non-eyeglass wearers just use the eyecups in the fully extended position. But if you do wear glasses, you can adjust them to the exact distance that works best for you to ensure that you view the full field of view. The maximum eye relief is 16mm, which should be more than enough for most people who wear glasses. One of the improvements both aesthetically as well as functionally on the "new" Spirit is the focusing wheel which now has a good looking silver trim to it and also includes a grooved rubber track on it to make focusing even better than before. It still only takes about 3/4 of a turn to go from infinity to it's closest focusing distance of 2.8 meters (9.2ft). In terms of being able to quickly focus this is excellent as many binoculars take a full turn of the wheel or more. Such an aggressive mechanism can make it a little harder to fine tune your focus as any small movement of the wheel moves the focusing plane a relatively further distance, but I never had any problems on the pair I was testing and I personally would opt for this over a binocular where you have to rotate the wheel a number of times to get to where you want. The diopter adjustment has also changed and is now a hard rubber ring. It allows you to adjust the lenses separately to allow for differences each of your eyes and plays an important part in correctly focusing your binoculars. It is located on the right barrel and was smooth and easy to adjust, whilst tight enough so that it should not easily be moved accidentally. As mentioned earlier the biggest improvement on the Spirit Plus binocular is the addition of ED glass (extra low dispersion) that is only used on high end cameras, telescopes, microscopes and binoculars. The Extra low dispersion glass prevents chromatic aberration (color fringing) because it concentrates and directs the wavelength of light more effectively onto your eyes. Lenses made from extra low dispersion glass have less air bubbles and glass deformities that are more likely to cause image distortion. As well as the ED glass, Vanguard use a whole host of coatings to ensure a bright and high quality image is produced. So good in fact, that Vanguard themselves say that the Spirit ED has a light transmission of up to 90% which "results in a near-perfect viewing experience." To start with and as you would expect in any quality roof prism binocular, these use BaK-4 prisms as opposed to the far inferior (and cheaper to make) BK-7 prisms. On top of this Vanguard have gone a step further and added a set of phase correction coatings on the prism glass that keeps light in correct color phases with the result of producing clearer images and better color reproduction. The optics on the Vanguard Spirit ED binoculars are also fully multi-coated, which means that all air to glass surfaces have received multiple layers of antireflection and other coatings meaning that more light gets to your eyes. Some of these coatings include Vanguard's own V-Max coating, a silver coating that is applied to the lenses that they say is amongst the "most cutting-edge lens treatments in optics" that provides near perfect light reflection and will result in a brighter as well as sharper contrasting image. All air-to-surface lenses also have an AR (Anti-reflection) coating that reduces the amount of light reflected away from the lenses that again will improve image brightness, even on the sunniest days. Vanguard have also added their own Emerald Coating to the objective lenses that they say has been specifically designed to bring you the full spectrum of color within the band of green tones. This idea is specifically aimed at the nature observer as it is said to ensure the "most vivid and natural shades of green." So do all these excellent components and coatings add up to produce a superior image? Well as with all my reviews, I compared the view through these with my benchmark binoculars. Even in good sunny conditions, I could notice a slight difference between the two, with the Vanguards being brighter. This became even more obvious when I compared them again at sunset and on another day when it was very overcast (it was actually snowing!) - so in very poor light conditions. So overall I would that they rate very highly compared to other 10x42 binoculars. As well as bright, in my opinion the image produced was very sharp and their contrast was also very good. This was one area that their was a noticeable improvement between these and the benchmark, especially in low light conditions. Whist this may seem like a minor point to some, it can really make an objects stand out that much better and feel more three dimensional. this can also help with being able to spot things like a small bird within the dark canopy of a tree for example. One of the coatings on the lenses (see above) is Vanguard's Emerald Coating which they say helps to provide the full spectrum of color within the band of green tones for more vivid and natural shades of green. To be honest with my eyes, other than the brightness and sharpness of the image as already discussed, I could not notice any differences in the greens when looking at things like trees compared to my benchmark. What I will say however is that the colour produced does feel very natural and you cant see any tinting of the image as you sometimes find on cheaper optics, especially those with ruby coatings that often have an unnatural greenish tint. The ED glass also obviously works as I could not notice any colour fringing (chromatic aberration) around the edges of objects that you find with cheaper optics and the amount of softening of the image on the periphery of the view was also very minimal. Compared to other binoculars in their price range in terms of image quality these are easily some of the best and are as good as many that are many times the price of these. Like all 10x42 binoculars, these have an Exit Pupil of 4.2 and a Twilight Factor of 21, both of which are fine fine for most low light conditions like twilight. (I often use a 10x42 binocular on game drives that either end just after sunset or leave at sunrise without any problems). Whilst these figures do not take into account the quality of the lenses and prisms, they do make it possible to compare the performance of binoculars in low light conditions and as we have already mentioned these Vanguard's do have really good quality lenses, prisms and coatings that will produce a brighter image than inferior binoculars of the same configuration. The 10x42mm combination for me is ideal for general wildlife observation and was my size of choice whilst working as a safari guide. This is because for me they offer the ideal compromise between a powerful magnification, field of view, light gathering potential and size. Ideal for getting as close to the action as possible without the need for image stabilization or a tripod, yet still with a wide enough field of view to make them more than decent birding binoculars. The apparent field of view for the Vanguard Spirit ED 10x42 is 105m at 1000m / 315ft @ 1000 yards (6°) that does fall a little short of the very best, for example the Minox 10x42 BV BRW (342ft at 1000 yards) and the Swarovski 10x42 EL's (330ft at 1000yards), but it must be remembered that these Vanguard's are literally a fraction of the cost of a pair of Swarovski's. Close focusing distance is 2.8 meters (9.2ft), which is about average, with anything under 6ft being very good. Whilst it may not be fair to compare a mid priced binocular like this Vanguard Spirit ED with the very top of the range, it does throw up a few interesting points. Below is a table comparing some of the main specifications of these with some of the best 10x42mm binoculars that money can buy. The Swarovski 10x42 EL's, the Leica 10x42 Ultravid HD Binoculars and the Zeiss 10x42 Victory FL Binoculars. What this does show is that even though these Vanguard binoculars are a fraction of the cost of the very best 10x42's that money can buy, they can compete and even beat them in some areas. As you can see strong points for the Vanguard is it's low weight and fairly compact size. Weak points are it's field of view and close focusing distance. There is a small cover or cap on the front of the central pivoting point that screws off. This allows you to then screw on a binocular tripod adapter (not included) that uses the standard ¼-inch threading, which you can then attach to your tripod. I do like the soft black carry case that is of good quality as is the very good quality as well as comfortable neck strap. A nice feature of these binoculars is that you can convert the neck strap to the carry bag strap using the clips. This allows you to have a very comfortable and longer carry bag strap if you are not going to be using your binoculars and then to quickly move the strap onto the binoculars when using them. I also liked carrying the binoculars in my hands using the "short" version of the strap which makes for a very secure way of holding onto them. The plastic lens caps fit well and should not accidentally fall off they also have fittings that enable you to loop them through the neck strap. A lens cleaning cloth is also supplied. These 10x42 Vanguard Spirit ED binoculars are at the time of writing available for around $300 (£300) - making them just sit in my category of mid priced binoculars. Which if you take into account that the highest quality optical elements and coatings are used as well as the lightweight and excellent quality body it is very impressive and must surely be one of the best value for money binoculars out there. Weak points? It is hard to be too critical of these especially when you take into account their excellent price point, but for them to be perfect you would probably wish for a slightly wider field of view and possibly a closer minimum focusing distance. Having said that if a wide field of view is really important to you, you are far better off sacrificing a little magnification and choosing the 8x42 version. Overall if you are looking for a very high quality binocular and a step up from ones that don't feature ED glass and that don't cost the earth that are ideal for any form of nature observation, hunting in open areas and great general use binoculars and then I highly recommend, the Vanguard 10x42 Spirit ED binocular. 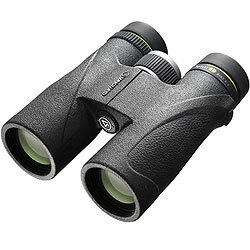 Like the standard version, it is a fantastic pair of binoculars at a great price. Highly Recommended. I bought these binoculars through Amazon.co.uk after reading great reviews on Binocular sites about them I was not dissapionted by their performance absolutely crystal clear views, pin sharp focus, vivid colurs really crisp almost 3D like, and SO BRIGHT.. all this with solid build quality. 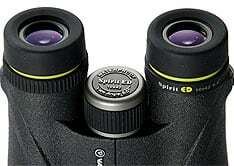 The binoculars are waterproof/fogproof they are phase corrected, have an emerald coating, a V-max silver coating, and an anti reflection coating, the prisms and optics use ED glass for extra low light dispersion.. all the features usually only seen in top class �600-�1000+ binoculars these Vanguard Spirit ED 10x42 binoculars are superb and can compete with Leica, Swarovski,Zeiss for a quarter of their prices. All this for way under �300, You just can't get a better pair of roof prism binoculars at this price well done Binoculars-UK. By the way did I mention how light they are 640g and that they come with a nice bag and excellent neck strap. These really are excellent binoculars with 16mm of eye relief and twist up eye cups all made with quality soft rubber, smooth precise focus and good field of view. In testing these along side my trusty Carl Zeiss 8x30 jenoptems the Vanguards blew them away for clarity, colour, brightness. They even out performed my Swift Audubons ED. 8.5x44..which are great.. I could see no colour fringing or other lens problems you get with all binoculars. To sum up if you want 10x magnification, light weight, top quality, all the coatings and ED glass get on to Amazon or if your near Blackpool go see Richard at Binoculars-UK now for a great deal. I am in no way affiliated or reviewing the above binoculars for any company or website this is my own honest/personal review of the Vanguard Binoculars. Product was sent quickly and the quality is amazing and easily outperforms binoculars that are far more expensive. 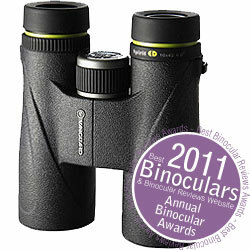 For a quality all round binocular I believe these cannot be bettered. Optical quality is superb and they are lighter than the more expensive competition. I would highly recommend these. I'm not an expert on binoculars and I purchased these for a safari in Namibia. They're rugged and the view is bright even in low light. They claim to be waterproof too, and come with a comfortable nylon case. I'm happily satisfied with them and I'm happy to recommend them. Designed with an outstanding price to performance ratio, these binoculars with quality features offer plenty bang for your buck.